St. Charles Parish’s Teachers of the year: Angelle Bourgeois at Norco Elementary School, Bryan Perissutti at J. 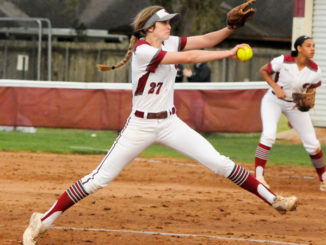 B. Martin Middle School and Jessica Glass at Destrehan High School. 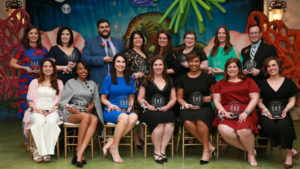 St. Charles Parish Public Schools honored its 2018-19 teachers of the year during an “Evening Under the Sea” at the annual banquet held on March 14 at Ormond Plantation in Destrehan. 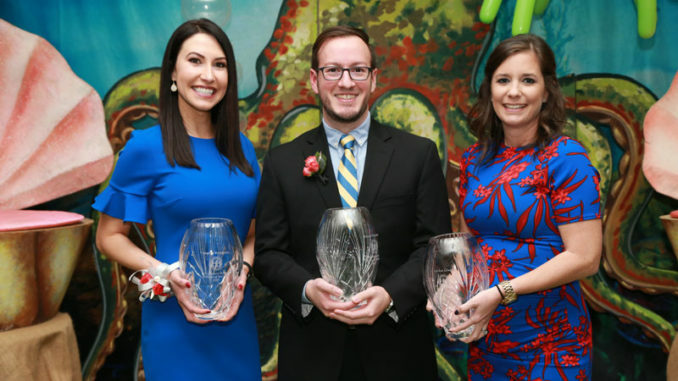 Three teachers were named Teacher of the Year: Jessica Glass at Destrehan High School (DHS), Bryan Perissutti at J. 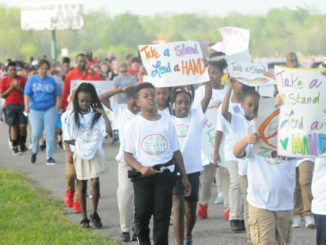 B. Martin Middle School and Angelle Bourgeois at Norco Elementary School. At DHS, Jessica Glass’ decision to pursue teaching as a career came with her “amazing college algebra professor” who made math make sense and connected with her students. Glass said her path became clear. In her first semester at DHS, she was a floating teacher and a substitute one period of the day. It wasn’t ideal, but Glass stayed focused because she loved the school and recognized it as an opportunity for humility and to get better organized. 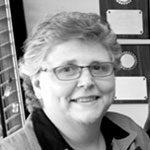 She became assistant soccer coach and organized a cross-country team in 2011. During her semester there, she helped change how Algebra 1 classes were taught for at-risk students, which led to her being named team leader, and more students passing math. 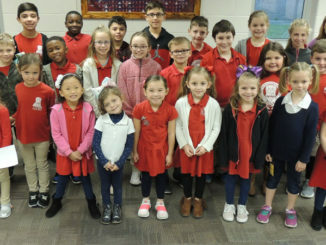 St. Charles Parish Schools finalists for Teacher of the Year 2018-19. Bryan Perissutti was named Middle School Teacher of the Year with just 3-1/2 years experience in the position. “At the end of my graduate studies in December 2015, if you had asked my colleagues in the program where I would end up, most would not have chosen the classroom,” Perissutti said. He had made a name for himself in the Department of History and Political Science as a fierce debater, “a ravenous consumer of history” and a likely future Ph.D. candidate. But when he completed the Master’s program and came to the fork in the road, he chose the classroom. The move into teaching has far exceeded his expectations. For Angelle Bourgeois, becoming a teacher and making a difference in childrens’ lives has been her goal. In addition to her teachers, Bourgeois said her siblings inspired her, too. Bourgeois’ brother was diagnosed with autism and her younger sister diagnosed with learning disabilities, both instilling a strong desire to share what she learned in school with them and finding ways to help them learn. In her love for her siblings, she found her calling. Bourgeois considers her great contribution is educating future leaders, helping to excel academically and develop good character and integrity. She recounted one example where a student she taught didn’t like school and often commented that he believed he wasn’t good at anything. After moving away and returning for a visit, he shared with her how well he was doing in school and that he was tutoring children at his church. She fought back tears as she reminded him of his endless potential.